Listen to today’s The Daily Article Podcast, then subscribe. A South Carolina woman won $1.5 billion last October. However, she did not claim her winnings until March 4. She spent that time researching professionals to help her preserve her anonymity and manage her new fortune. She has decided to keep her identity private for her personal safety. While she is not revealing her name, we do know what she is doing with her winnings. She donated to the Alabama Red Cross to aid tornado relief; the Ronald McDonald House of Charities of Columbia, South Carolina; In The Middle, a charity that helps women with breast cancer; the City of Simpsonville Art Center; and the One SC Fund for Hurricane Florence relief. After a gunman killed eleven worshippers at Pittsburgh’s Tree of Life Synagogue last October, Muslim communities around the world held vigils to show their support and raised more than $1.4 million for the survivors. Now, Jewish communities are reciprocating as Muslims grieve following the deadliest shooting in New Zealand’s history. Fifty Muslims were left dead at two mosques in Christchurch last Friday. In response, Jewish leaders are raising donations for the New Zealand Attack Emergency Relief Fund. Why did Jesus start his church in the most sinful place imaginable? Yesterday, it was my privilege to stand with our tour group at Caesarea Philippi. The site is beautiful beyond description: natural springs flow through the area and constitute one of the four headwaters of the Jordan River as it flows south into the Sea of Galilee. People have been coming to this site for millennia to camp, drink the water, and enjoy the spectacular scenery. But Jesus and his disciples came here for a different reason. For all its natural beauty, Caesarea Philippi was one of the most ungodly places on earth. Fourteen temples to the worship of Baal were scattered across the area. Travelers brought idols they placed in niches carved in the rock, praying to these false gods for protection on their journeys (we can still see the niches today). A temple for the worship of Caesar Augustus stood here, as did a temple for Zeus. The area was especially known for the worship of the Greek god Pan, with rituals that involved sexual immorality too horrific for me to describe here. Jesus established his church, not at Jerusalem’s temple or Capernaum’s synagogue, but at Caesarea Philippi, the most sinful, hedonistic site in their part of the world. He did so with the commission to attack the gates of hell, wherever they are. We are the church when we attack hell wherever we find it. We are a church to the degree that we do so. If we do not assault the gates of hell, we may be a religion, a denomination, or an institution, but we are not the church. We are the church when we attack hell wherever we find it. If a lottery winner can make headlines for her generosity in sharing her luck, and Muslim and Jewish leaders can deservedly win applause for supporting each other in tragedy, why can’t followers of Jesus love the world to our Lord? Why can’t we show his grace in our compassion so powerfully and personally that others know we are Christians by our love (John 13:35)? The key is to see lost people the way Jesus sees them. Who are the “Druze” in your life? As I was speaking to our group yesterday, a large group of Druze teenagers paraded by us. The Druze are a small sect, comprising 2 percent of Israel’s population. Incorporating parts of Islam, Hinduism, and Greek philosophy, they are in no sense Christians. As the Druze teenagers made their way into the park, they were creating so much noise that I had to stop speaking until they passed. We felt annoyed at the disruption. Afterward, however, my wife made an excellent point: those teenagers represent the very people Jesus established his church to reach. They are what he meant by attacking the gates of hell. Treating them not as a disruption but as an opportunity for the gospel would be the way to be the church. God was illustrating this thought even as I was preaching it. Here’s the question: Who are the “Druze” in your life today? NOTE: If someone asked you why Easter is so important, how would you respond? 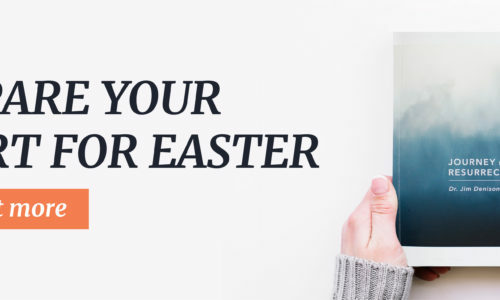 Journey to the Resurrection, a new fifteen-day devotional guide I wrote, will equip you to take any opportunity you have to share Holy Week’s eternal significance with your family and friends this Easter. Request your copy when you give today to help more people discern the news differently! The post What is an anonymous $1.5 billion lottery winner doing with her money? appeared first on Denison Forum. What is an anonymous .5 billion lottery winner doing with her money?